Divya Sarvkalp Kwath is made of herbs for the revitalization and nourishment of liver. Liver plays an important role in the digestion of food and Divya Sarvkalp Kwath detoxifies liver and improves its functioning. Advantages: Divya Sarvkalp Kwath acts as a liver tonic by detoxifying it and supports liver function. The natural herbs in the Sarvkalp Kwath provide nourishment to the liver and strengthen it and improve liver secretions like bile juices. It is recommended for patients suffering and recovering from Jaundice for quick recovery. Divya Sarvkalp Kwath also treats all kind of hepatitis and helps in regeneration of liver cells. With the proper functioning of the liver Sarvkalp Kwath also helps in improvement of digestive system. Directions of Use: Take 1 teaspoon (5 grams) of Divya Sarvkalp Kwath and boil in 400 ml water till the water remains 100 ml. Separate the residue and drink twice a day, once in morning on empty stomach and 1 hour before dinner. Do not keep the prepared Kwath for future use. Prepare fresh Kwath every time before consuming. 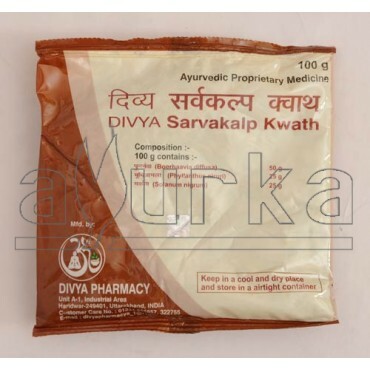 Packing: Divya Sarvkalp Kwath is available in pouch packing of 100 grams. 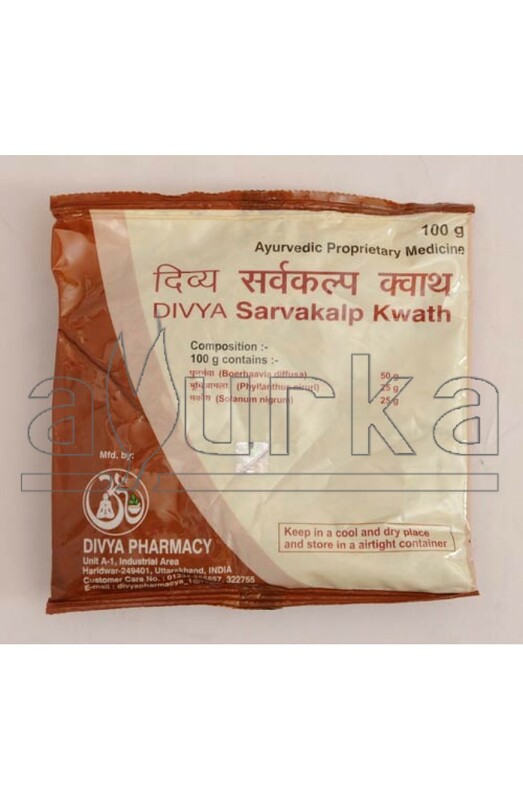 Divya Sarvkalp Kwath is 100% natural and not known to have any side effects on the body. it can be taken during the treatment of Jaundice, hepatitis and other liver related diseases. It can also be taken regularly for the strengthening and overall improving the functioning of liver. However it is always recommended to give a break of few days after the completion of treatment or after completing 10 days course, in order to avoid any kind of dependency, which the body may develop on Kwath. Dosage: 100 grams for 10 days.